Seasonal allergies indicate an underlying immune system imbalance. There can be various causes for a suboptimal immune system and the reasons can vary from person to person. Ultimately, the goal is to identify and address the triggers and mediators in order to reduce inflammation and the production of histamine. 1. Gut Health. An unhappy GI tract (bad diets full of sugar, processed foods, dyes, etc.) will contribute to GI inflammation and an increase in HISTAMINE levels–>increase in allergy symptoms. 2. Food Intolerances. This is a big one. DAIRY INTOLERANCE is notorious for causing “allergies”–runny nose, stuffy nose, sinus congestion, sinus headaches, asthma, post nasal drip, etc. WHEAT/GLUTEN INTOLERANCE is another biggie. But, it’s important to note that ANY FOOD can be a problem. 3. NSAIDs and Ibuprofen Use. These medications can cause a leaky gut/GI inflammation, which can cause an increase in HISTAMINE levels. 4. Alcohol. Yep. Sorry to be the bearer of bad news. Especially with football season upon us. Alcohol can contribute to GI inflammation–>increase in HISTAMINE levels. 5. Stress. Stress often results in a decrease in enzyme production–>undigested food–>GI inflammation–>increase in HISTAMINE levels. 6. Environment. Molds and pollens. Reactivity will vary from one person to another. 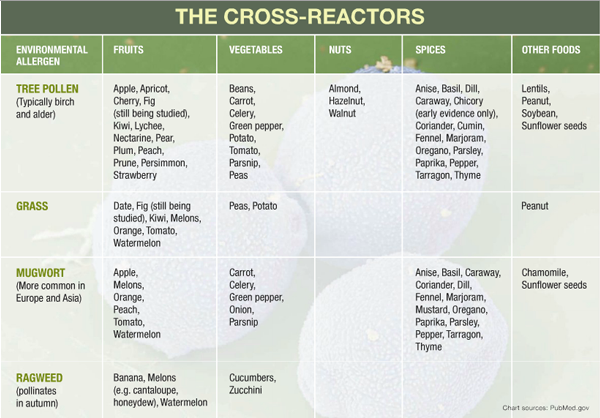 Beware of cross reactivity between certain pollens and foods. MOLD is a big problem for many, and it can be hard to find–water leaks near sinks, bathrooms, basements, roofs need to be inspected. 7. Antibiotic use. Sometimes antibiotics are needed, but the overuse and unnecessary use of antibiotics is contributing to some really imbalanced GI microbiomes. This, too, will lead to GI inflammation and elevations in HISTAMINE. Don’t take antibiotics if you don’t need them! 8. Lack of Dao Enzyme (diamine oxidase). This enzyme is responsible for the breakdown of histamine. Some people don’t make enough for different reasons–nutrient deficiencies and/or genetics. Certain foods can “cross-react” with specific allergens and increase the severity of symptoms. When allergy season approaches, you may want to try eliminating the foods that could exacerbate the problem. Here are some things I often recommend to my patients who suffer from allergies. 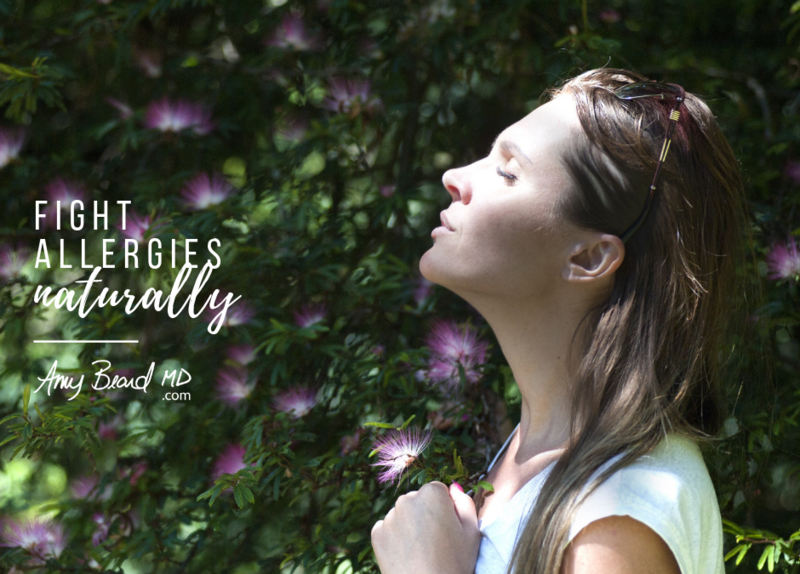 Since the cause of allergies can be different from one person to the next, I recommend tailoring your approach to prioritize and address the causes you suspect or have identified. 1. First and foremost, clean up your diet. PRONTO. Especially avoid junk foods, processed foods and artificial sweeteners. Eat real food and take it easy on the alcoholic beverages. Stick to organic, non-GMO, whole foods and grass-fed and/or pasture-raised meat and eggs. 2. Identify possible food intolerances by completing an Elimination and Reintroduction Diet. Wheat, dairy, corn, eggs, and nuts are the most common, but you can have an intolerance/sensitivity to ANY food. This must be done correctly to get good data. If you’d like support in doing this well, we can help! 3. Avoid NSAIDs like ibuprofen and acid suppressing medications as these can cause leaky gut and GI inflammation, which causes elevations in HISTAMINE. That said, there are MANY other medications that can negatively impact the GI tract. I recommend doing research on everything you may be taking. 4. Increase your intake of QUERCETIN, a mast cell stabilizer. Foods high in quercetin are citrus fruits, onions, apples, parsley, tea, tomatoes, broccoli, & lettuce. Quercetin is also available in an OTC capsule. 5. Increase your intake of OMEGA 3 FATTY ACIDS! These anti-inflammatory nutrients can also dampen down the histamine response. Foods high in OMEGA 3 FAs: cold-water fish (salmon), walnuts, flaxseed oil, grass-fed beef and eggs. 6. Try STINGING NETTLE. Stinging Nettle is a natural alternative to allergy medications. It works very similarly without the side effects. You will need to take it more often, though. **NOTE: You can find all of the aforementioned supplements at Fullscript, our online dispensary. 7. Use a NETI POT. I’m a big advocate of this to clean out the sinuses. If my 6 yr-old nephew can do it, so can you. Most importantly, this has been shown to reduce the need for antihistamines for those with seasonal allergies. 8. Take your shoes off before coming inside in order to avoid bringing in pollens and dander. 9. Close the windows on windy days. Dust and pollen can really getcha goin’. Make sure to clean and replace your filters regularly. 10. Look for mold in your home or work environment. You’d be surprised by what you might find. Water leaks are notorious for causing a mold-loving environment. Old buildings are highly suspect, but even newly built homes can have problems.